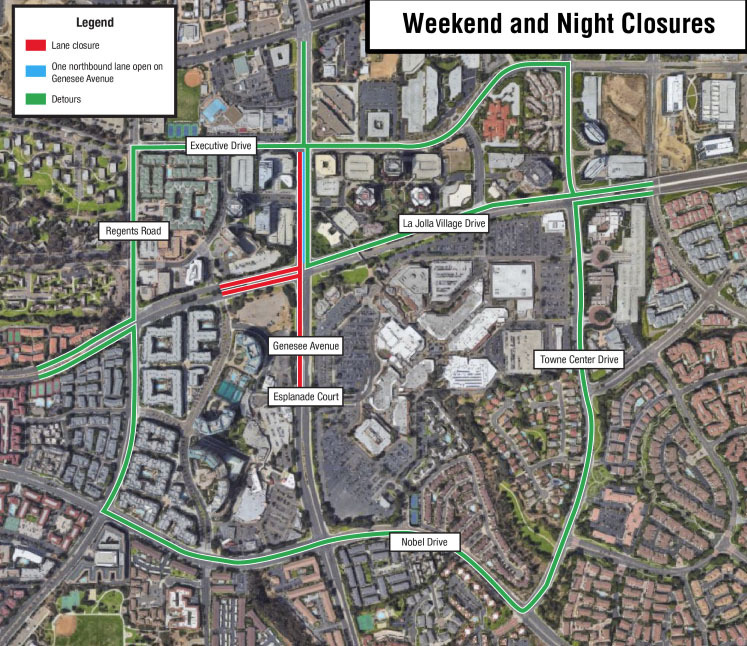 SAN DIEGO (KGTV) - Drivers in the University City area are being warned of the start of a major construction project that will shut down heavily used streets for the next week. 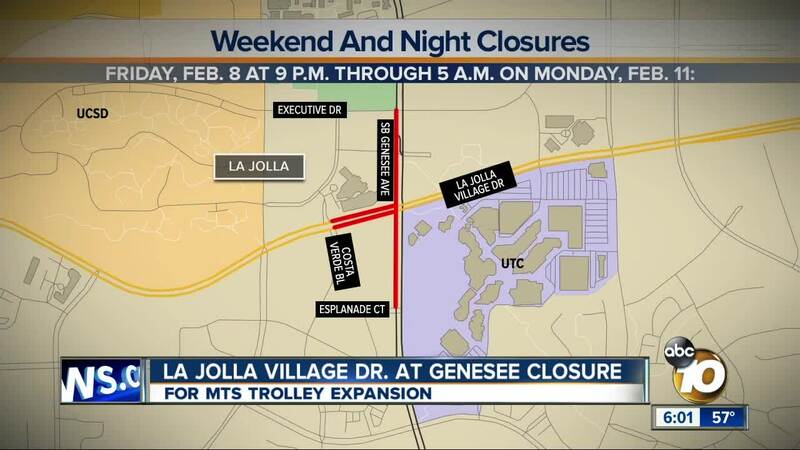 Already considered one of San Diego’s most congested intersections, La Jolla Village Drive at Genesee Avenue -- next to the busy UTC shopping mall -- will be partially closed starting Friday, Feb. 8, as part of the Metropolitan Transit System’s Mid-Coast trolley extension project. 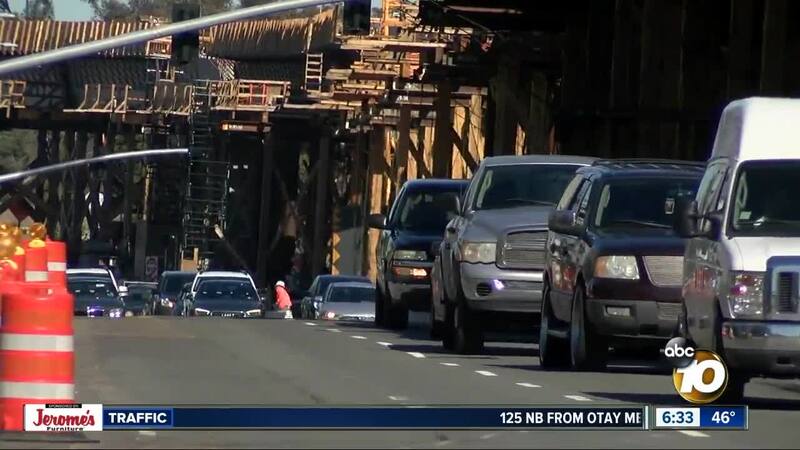 According to the San Diego Association of Governments, the closures are necessary to install 60-foot concrete girders, which weigh up to 200,000 pounds and are part of the infrastructure for the MTS project. 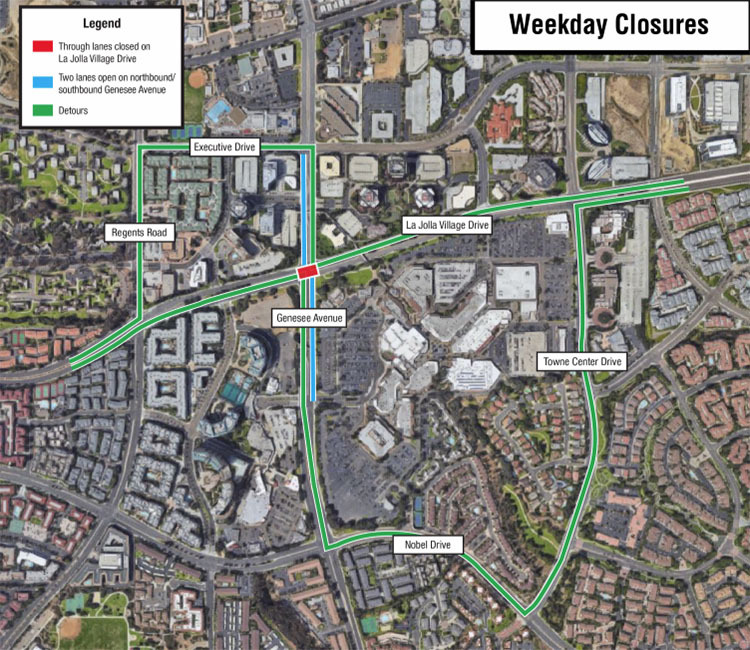 Partial closures will be necessary until Feb. 15, when SANDAG officials expect the girders to be set and the concrete to be dried. Friday, 10News met Susanne Davies walking along La Jolla Village Drive. The Englishwoman moved to UTC three years ago. She and her husband said traffic seems to get worse every year. "Rush hour is the worst. People get super mean when they're driving during rush hour. They block all the intersections. They block the crossways," Davies said. She anticipates a total traffic nightmare this coming week. But she said can tolerate one week worth of traffic jams because, by 2021, the trolley will connect her neighborhood to the rest of San Diego. "Driving to downtown is not easy because you can't get parked. The bus route at the moment is not easy, so the end result will be good. But it's just this inconvenience," Davies said. Detour signs will be in place to alert drivers of the affected streets. 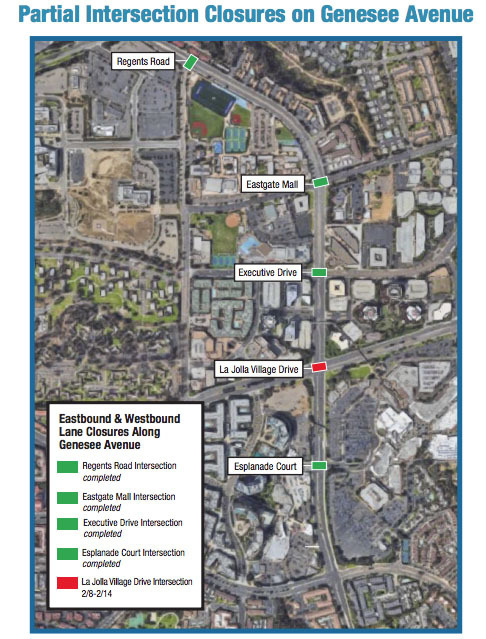 According to SANDAG, La Jolla Village Drive at Genesee Avenue is the last intersection requiring a long-term closure to install the girders. More than 44,000 residents use the intersection during the week, the agency said. The closures are part of the $2.17 billion Mid-Coast Trolley Blue Line Extension, which includes a planned 11-mile extension of trolley service by MTS from Santa Fe Depot in downtown San Diego to University City. The extension will add trolley stops in Mission Bay Park, UC San Diego and Westfield UTC. SANDAG is receiving $1.04 billion in funding from the Federal Transit Administration to complete the project.